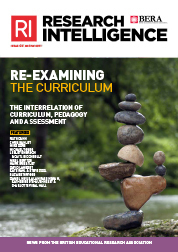 This special issue – guest edited by Ruth Dann and Chris Hanley, convenors of BERA’s Curriculum, Assessment and Pedagogy Special Interest Group (SIG) – re-evaluates the curriculum from a variety of perspectives, asking underexamined questions about what and who it is for, and how it can best be best structured to engage students. It includes thoughtful expositions of the curriculum across the four nations of the UK, which illustrate how the curriculum has been conceived and enacted though policy, how it has been remoulded and redirected as policy has been translated into practice. With this collection, the editors hope to open up a debate about how the curriculum might be rebalanced in our schools, including by revisiting and re-evaluating the theoretical and practical insights on the curriculum that shaped both the curriculum and teachers’ practices several decades ago. the re-emergence of curriculum studies as a field of enquiry. Elsewhere in the issue, we feature a report from the Future of Educational Research in Wales conference recently put on in Cardiff by BERA in partnership with the Welsh government; the launch of two new SIGs, and two new appointments to BERA council; a look ahead at a busy year for the British Curriculum Forum; the launch of the Early Career Researcher Network’s event funding scheme; and a view from South Africa on the role of language in the country’s ongoing debate about the decolonisation of education.